Skillet-baked cookie pies are an indulgent twist on classic chocolate chip cookies. They’re larger than their traditional counterparts and are typically baked until they are just-set in the center, so they are soft enough to eat with a spoon when they are warm. 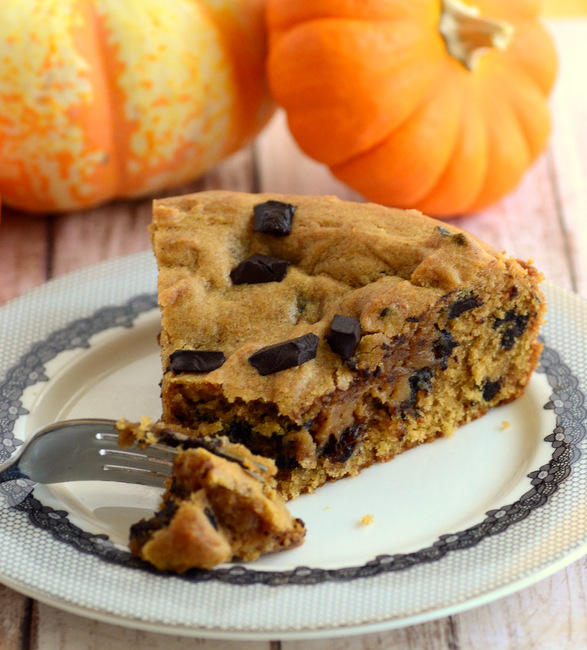 This Pumpkin Chocolate Chip Cookie Pie is a fall twist on this timeless treat. The cookie dough has pumpkin puree and a generous dose of pumpkin pie spices in it, giving it a fantastic seasonal flavor that is perfect for end-of-the-year baking. Like a bar cookie, this cookie dough recipe starts out with melted butter. Melted butter helps to give the cookie a denser texture, exactly what you want when you’re trying to create a cookie that is fudgy in the center. The butter is combined with sugar, brown sugar, an egg and pumpkin puree. The pumpkin puree brings in a pumpkin flavor (of course! ), but it also contributes to the soft, tender center of the cookie after baking. The whole thing is easy to put together and should only take you a couple of minutes. Since this recipe doesn’t need a lot of pumpkin puree, set aside any leftovers for pumpkin bread, pumpkin cookies or other pumpkin recipes. Leftovers – if you’re using canned pumpkin – can be stored in an airtight container in the fridge for a day or two if you can’t use it up right away. The cookie dough should be spread into a lightly greased, 8-inch oven-safe skillet to bake. If you don’t have a small skillet, you can use a 8-inch round baking dish or an 8-inch pie plate. A larger dish can be used, but you’ll get the best crust-to-center ratio if you can use an 8-inch pan. The cookie pie is ready to eat after it has cooled for at least 20 or so minutes. It will still be soft in the center, but the outer edge should be golden brown and set. The pie is absolutely delicious when warm, but you might want to eat it straight from the pan with spoons if you’re going to dig in right away. It is much easier to slice when it’s at room temperature, if you want a neater presentation. Slices can always be reheated in the microwave, as needed. Preheat oven to 350F. Lightly grease an 8-inch skillet or 8-inch round cake pan. In a small bowl, whisk together flour, baking soda, salt and pumpkin pie spice. In a large bowl, whisk together butter, sugars, egg and pumpkin puree. Stir in flour mixture, mixing until no streaks of dry ingredients remain. Stir in chocolate chips. Bake for 30-35 minutes, until pie is set in the center but still looks moist. Pie may sink slightly as it cools. Allow pie to cool for at least 30 minutes, or to room temperature, before serving. GOOD ONE! 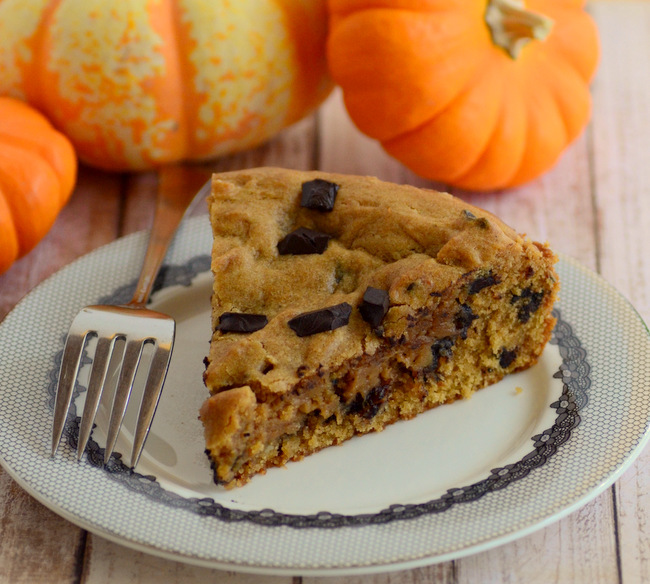 Pumpkin and chocolate chip cookies are natural lovers and this is a beautiful way to unite these two star-crossed flavors!